Jesus said: Where two or three are gathered together in my name, there am I in the midst of them. (Matt 18: 20) On Sunday, 29th April there is a national initiative to surround the coasts of England, Scotland and Wales with prayer and encircle them with a Living Rosary for Life, Faith and Peace at 3.00 pm. The Knights of St Columba (Council 60) Carlisle, invite parishioners to join them at Port Carlisle, near the Hope and Anchor Public House, on Sunday 29 April at 2.30 pm, to participate in the national Rosary on the Coast taking place around the coast of Great Britain that day starting at 3.00 pm. For those unable to attend on the coast - there will be a gathering at St. Margaret Mary from 2.30 pm that day. Please support this important initiative endorsed by Pope Francis - you receive the Apostolic Blessing by participating in this initiative. In conjunction with the concert in the Sands Centre, there is a raffle underway to help raise funds for the chapel in the new school. These are on sale after Mass this weekend. Thank you for your support. In England & Wales, we have reverted to celebrating the Ascension of the Lord on the day itself, rather than on the following Sunday. There will be a Vigil Mass at Christ the King at 7.00 pm on Wednesday 9th May, Mass at 9.30 am at St. Margaret Mary [with Primary School] and at 11.45 am at Christ the King [with Newman School] on Thursday 10th May. Our local Life group invites parishioners to a talk by Dr Philip Howard on Monday 30 April at 5.30 pm in Waterton Hall at OL&SJ. See the poster in the foyer. Further details from Joe McGarry, north.cumbria@lifecharity.org.uk. Our Church history course concludes on Tuesday evening at 7.30 pm in the Parish Centre. Many thanks to all who have attended. Attendance - 250. Offertory - £703.45. A major fund-raising event for Newman Chapel will be a variety show, That’s Entertainment, to be held on Friday 11 May 2018, in the Sands Centre. Tickets may be obtained from the Sands Centre - £10/£8. PLEASE SUPPORT THIS. If you would like a ticket please use sign up sheet in church. On the weekend of 7th-9th September, there is a national Eucharistic Congress in Liverpool to deepen our appreciation and love of the gift of Christ in the Eucharist. There will be a parish pilgrimage to the Congress on Saturday 8th September, where the key-note speaker is Bishop Robert Barron. To sign up for this [the cost will be £50] - please use the sheets provided. More details will be available nearer the time but we need to confirm numbers for tickets. Sponsored Walk - a new venture to raise the funds to support our work. We are looking to recruit a small group for a challenging 15 mile walk in the Lake District, on Monday 28 May, with a target to raise £1,000 each. If you or a parishioner would be enthusiastic to take part, please get in touch; if people aren’t able to join us walking they can still support us through collecting sponsorship and we’d be grateful for your support in any way. Google Castlerigg Manor for more information about these events. On Friday, Fr. Michael has relocated (with the consent of diocesan officials) the residence of the parish priest to St. Margaret Mary. There are a number of reasons for this; but especially its position in relation to the schools [our Primary and the new site for Newman] and the Hospice. The Presbytery at Christ the King is to become a private residence and a tenant will be moving in on Monday of this week. Cor et Lumen Christi Community invites you to join them for a Spiritual spa day for women, led by Cathy Fava, on Saturday 5 May at St Cuthbert’s, The Old Convent, Wigton CA7 9HU. Donation only. For more information, phone 016973-45623, visit www.coretlumenchristi.org or e-mail stcuthberts@coretlumenchristi.org. A big 'Thank You' for your support, kindness and generosity. I miss you all very much. I'm slowly adjusting to life here. Please keep remembering me in your prayers. I am remembering you all daily in mine here at Knock. Sr Gerald [via Sr Maureen]. It was announced recently that the parish of Our Lady of Eden [Warwick Square & Warwick Bridge] has been linked with St. Cuthbert’s Wigton. Fr Loughran & Fr Osman will take pastoral responsibility for Wigton. In the short term, no change will be made to Mass times at Our Lady’s and Warwick Bridge, but it is likely they will have to change in the near future. The Ladies Group will meet on Tuesday the 1st May at 7.30 pm. The topic will be New York. Jesus said: Where two or three are gathered together in my name, there am I in the midst of them. 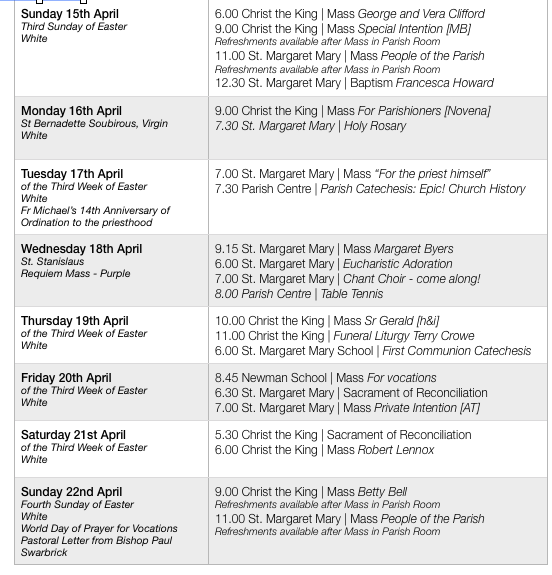 (Matt 18: 20) On Sunday 29th April, there is a national initiative to surround the coasts of England, Scotland and Wales with prayer and encircle them with a Living Rosary for Life, Faith and Peace at 3.00 pm. The Knights of St Columba (Council 60) Carlisle, invite parishioners to join them at Port Carlisle near the Hope and Anchor Public House, on Sunday 29 April at 2.30pm, to participate in the national Rosary on the Coast taking place around the coast of Great Britain that day, starting at 3.00 pm. The Carlisle and Penrith Circle of the Catenians is organising a pilgrimage by coach to the Carfin grotto near Motherwell on Saturday 28 April. A sign up sheet and information is available in both churches. A new initiative in the parish. If you fancy learning to sing some Gregorian Chant, why not come along to St. Margaret Mary on Wednesdays at 7.00 pm [after the Holy Hour]. We’ll begin with some basics and see how we get along…all ages welcome. No experience necessary. Our local Life group invites parishioners to a talk by Dr Philip Howard, on Monday 30 April, at 5.30 pm, Waterton Hall at OL&SJ. See the poster in the foyer. Further details from Joe McGarry, north.cumbria@lifecharity.org.uk. Our Church history course resumes on Tuesday evening at 7.30 pm in the Parish Centre. Attendance - 255 Offertory - £688.70. A major fund-raising event for Newman Chapel will be a variety show, That’s Entertainment, to be held on Friday 11 May 2018, in the Sands Centre. Tickets may be obtained from the Sands Centre - £10/£8. PLEASE SUPPORT THIS. If you would like a ticket, please use the sign up sheet in church. Thank you to all the parishioners who supported the Lenten Lunches in. A cheque for £170 has been sent from Christ the King and one for £200 from St. Margaret Mary for the charity Mary's Meals. Thank you for your generosity. It was announced recently that the parish of Our Lady of Eden [Warwick Square & Warwick Bridge] has been linked with St. Cuthbert’s Wigton. Fr Loughran & Fr Osman will take pastoral responsibility for Wigton. In the short term, no change will be made to Mass times at Our Lady’s and Warwick Bridge but it is likely they will have to change in the near future. Prayer cards are available in both churches marking the Episcopal Consecration and Installation of Bishop Paul Swarbrick as the 7th Bishop of Lancaster. We hope you managed to catch the superb coverage from ITV Border Lookaround last Monday night…! The Knights of St Columba (Council 60) Carlisle, invites parishioners to join them at Port Carlisle near the Hope and Anchor Public House, on Sunday 29 April at 2.30pm, to participate in the national Rosary on the Coast taking place around the coast of Great Britain that day starting at 3.00 pm. A walk along footpaths is involved for about 3 miles. See www.rosaryonthecoast.co.uk. The Carlisle and Penrith Circle of the Catenians is organising a pilgrimage by coach to the Carfin grotto near Motherwell on Saturday 28 April. Sign up sheet and information is available in both churches. A new initiative in the parish. If you fancy learning to sing some Gregorian Chant, why not come along to St. Margaret Mary on Wednesday 18th April at 7.00 pm [after the Holy Hour]. We’ll begin with some basics and see how we get along…all ages welcome. No experience necessary. Our local Life group invites parishioners to a talk by Dr Philip Howard on Monday 30 April at 5.30 pm, Waterton Hall at OL&SJ. See the poster in the foyer. Further details from Joe McGarry, north.cumbria@lifecharity.org.uk. Attendance - 256 Offertory - £669.16. Thank you. A major fund-raising event for Newman Chapel will be a variety show, That’s Entertainment, to be held on Friday 11 May 2018, in the Sands Centre. Tickets may be obtained from the Sands Centre - £10/£8. PLEASE SUPPORT THIS. Cor et Lumen Christi Community invites you to join them for Called to Glory 5: The Spirit of Glory, 14-15 April. Fr Gabriel Joseph and Niklas Carlsson of Cor et Lumen Christi will lead this weekend of inspirational teaching, praise and ministry. A spiritual spa day for women, led by Cathy Fava, Saturday 5 May. Both events at St Cuthbert’s, The Old Convent, Wigton, CA7 9HU. Donation only. For more information, phone 016973-45623, visit www.coretlumenchristi.org or e-mail stcuthberts@coretlumenchristi.org. Sr Gerald has asked that a Novena of Masses be celebrated for the Intention of Parishioners. These will be celebrated on a weekly basis for the coming weeks. Prayer cards are available in both churches marking the Episcopal Consecration and Installation of Bishop Paul Swarbrick as the 7th Bishop of Lancaster. We hope you managed to catch the superb coverage from ITV Border Lookaround on Monday night…! Holy Thursday - 93 Collection for SVP £180 Good Friday - 128 For Holy Places £234.20 Easter - At Mass 332 Offering £917.06 Thank you. 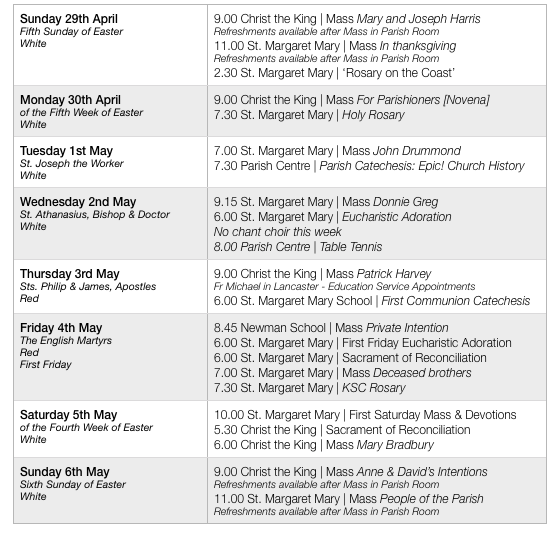 The Family Weekend (25-27 May) is an opportunity for families to come together for the weekend. There will be activities for all age groups and the opportunity to meet old friends and get to know new ones. Open to all families. Sponsored Walk - a new venture to raise the funds to support our work. We are looking to recruit a small group for a challenging 15 mile walk in the Lake District, on Monday 28 May, with a target to raise £1,000 each. If you or a parishioner would be enthusiastic to take part, please get in touch; if people aren’t able to join us walking they can still support us through collecting sponsorship and we’d be grateful for your support in any way. see how we get along...all ages welcome. No experience necessary. Jesus said: Where two or three are gathered together in my name, there am I in the midst of them. 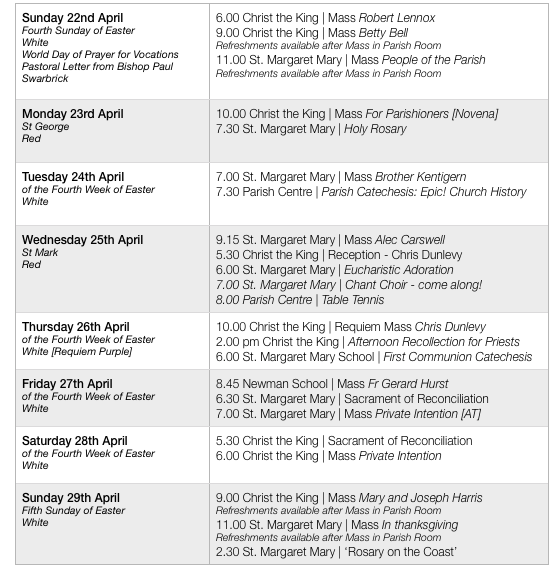 (Matt 18: 20) On Sunday 29th April there is a national initiative to surround the coasts of England, Scotland and Wales with prayer and encircle them with a Living Rosary for Life, Faith and Peace at 3.00 pm. The Knights of St. Columba Council 60 are organising to pray this Rosary at Port Carlisle...please see Paul Lovell, the Grand Knight, for more information. For those unable to attend on the coast - there will be a gathering at St. Margaret Mary from 2.30 pm that day. Please support this important initiative endorsed by Pope Francis - you receive the Apostolic Blessing by participating in this initiative. Cor et Lumen Christi Community invites you to join them for Called to Glory 5: The Spirit of Glory, 14-15 April. Fr Gabriel Joseph and Niklas Carlsson of Cor et Lumen Christi will lead this weekend of inspirational teaching, praise and ministry. A spiritual spa day for women, led by Cathy Fava, Saturday 5 May. Both events at St Cuthbert’s, The Old Convent, Wigton CA7 9HU. Donation only. For more information, phone 016973-45623, visit www.coretlumenchristi.org or e-mail stcuthberts@coretlumenchristi.org. To be held on Thursday, 12th April at Pirellis Social Club, Dalston Road, Carlisle in aid of Marys Meals supporting St Gabriel’s School in Liberia. Doors open at 7.00 pm / show starts at 7.30pm. Tickets: £5.00. For tickets and more information, contact: Maureen 07929 654859 2maureen_wilson@talktalk.net or Yvonne 07487 544517. 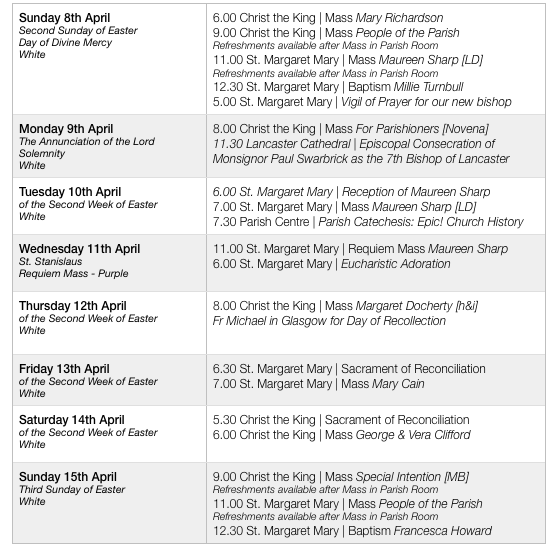 A celebration of Divine Mercy will be held in St Bede’s, Carlisle, on Sunday 8 April at 2.15 pm. Experience the mercy and the love of the Lord in this celebration. For details of the afternoon, see the poster in the foyer.